The brands new creative director, Jeremy Scott, took inspiration from the fast food chain for his debut runway collection during Milan Fashion Week. 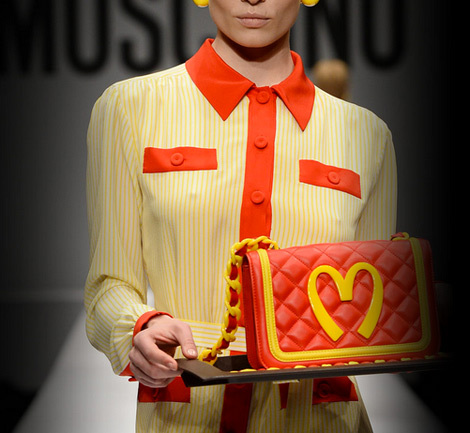 Moschino‘s new creative director, Jeremy Scott, took inspiration from McDonald’s for his debut runway collection during Milan Fashion Week 2014. Moschino’s Happy Meal Box-inspired red quilted leather bag—which was presented on a tray on the runway—costs $1,265 and has already sold out. The capsule collection also includes a sweater priced at $780, a T-shirt dress for $350, and an iPhone case for $78. Whether or not the clothing line lacks sensitivity or creativity, celebs and the fashion industry have had no problem embracing the street style-baiting collection. Katy Perry, Rita Ora, Anna Dello Russo, and Jourdan Dunn have all worn a piece from the McDonald’s collection.